Whether you prefer to soar way above or just above the canopy, here’s how to do when you’re in Peru! Is this the world’s most unique adventure: spending a starry Andean night in a cliff-side glass-pod hotel? You’ve probably seen those stunning shots of Peru’s diverse geography and landscapes filmed using a drone. So you’ll know exactly what you’re signing up for when you decide to become a human drone yourself – Peru has some exquisite opportunities for paragliding (don’t forget to hit record!). The view is way better from up here, and hey, no traffic! If you head to Miraflores, the scenic coastal tourist district of Peru’s capital Lima, you’ll be treated to a display of colourful dots in the sky. 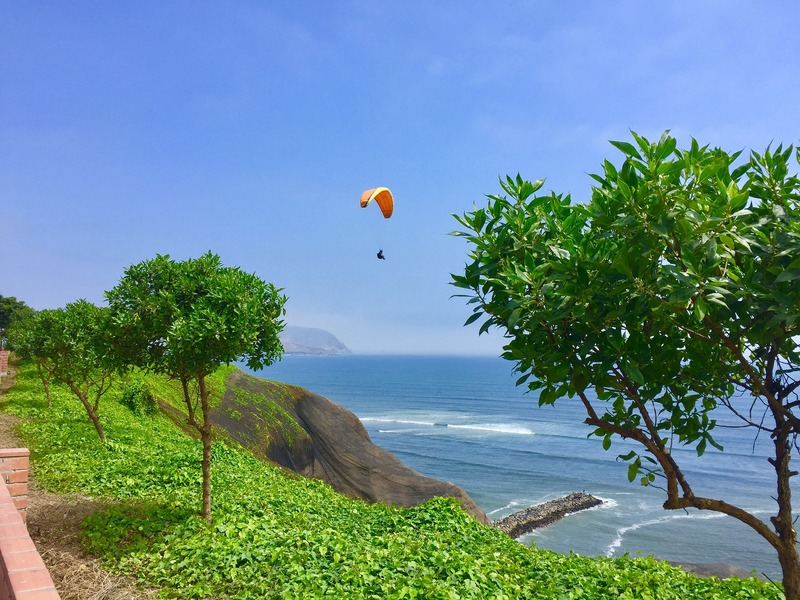 The Costa Verda (or Miraflores’ ocean-side) is one of the country’s best spots for paragliding. Just think: you’ll get to cruise over the Pacific and skip Lima’s crazy traffic at the same time! Just south of the capital, you’ll find the incredible Pachacamac pre-Inca/Inca archaeological site, and yes, it’s spectacular from the air (though don’t miss exploring it from the ground later). The coast provides plenty of locations to try the aerial sport, including in Pasamayo (just north of Lima), and further south in Pisco, Chincha, Paracas and even Nazca (imagine that bird’s-eye view over the Nazca Lines!). You can channel your inner condor at Callejon de Huaylas (outside of Huaraz) and the Sacred Valley (outside of Cuzco) for some breathtaking views of the alpine lakes, peaks and valleys of the Andes. Ziplining and Bungee Jumping: from Point A to Point Weee! The Amazon is a fantastic place to try ziplining, or canopy as it’s known in Peru. 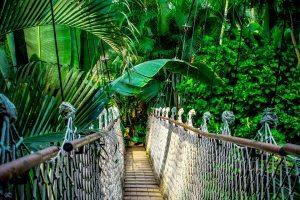 Make a beeline for the Tamshiyacu-Tahuayo Reserve, where you can glide across tropic treetops at 100 feet in the air, catching speeds that will have you out-flying every living creature, including mosquitoes! 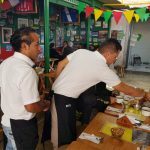 Iquitos has a zipline park that has been ranked as having some of the most exciting courses in the world and the longest zipline in the Peruvian Amazon. Zipline from canopy platform to platform, taking little breaks to observe birds and wildlife all around you. If you stay at Tahuayo Lodge, you can zipline to your heart’s content – there is unlimited access for guests. The Wasai Lodge near Puerto Maldonado can organize a zipline and wildlife tour in the Tambopata National Reserve. You’ll learn all about the local bird and other wildlife while on the ground, then join them up in the trees – the knowledge may excite or deter you depending on how big a jungle fan you are! Either way, this immersive experience is the true definition of eco-tourism. 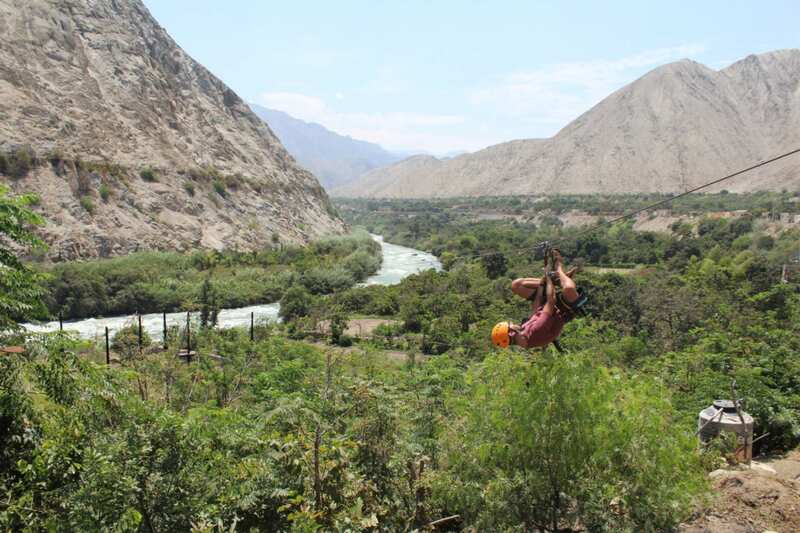 Closer to the coast, the adventure hub of Lunahuana has some spectacular ziplining across the Cañete River. Look below and you might just see your fellow adventure-lovers rafting down the town’s river. As you may or may not know, I have been known to pair this activity with some of the region’s pisco-sampling – but please, follow my lead at your own discretion. 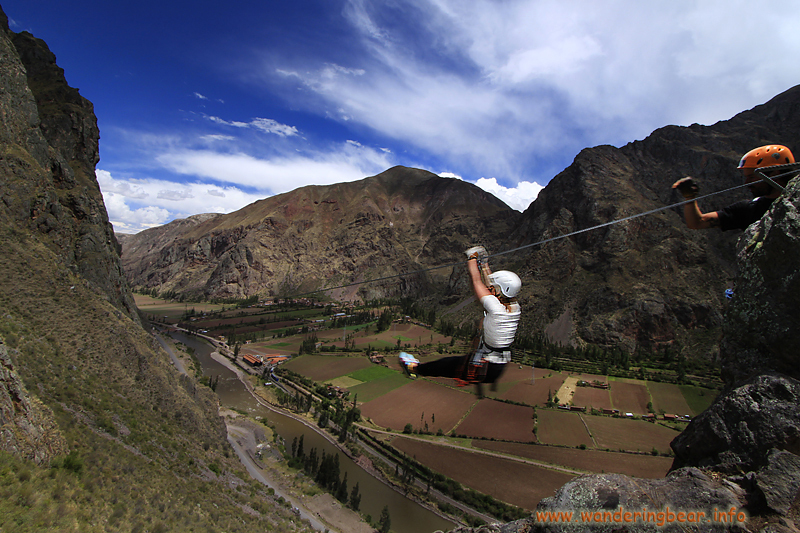 Few zipline courses in the world let you play around as much as in Peru – there’s enough freestyle poses and positions to try and leave people wondering if it’s a man or a plane! In the south Andes, there’s a zipline near the Colca Canyon at Chivay, in case you’ve always wanted to fly alongside condors. Trekkers along the Salkantay route to Machu Picchu have the option to zipline on the fourth day of the trek – don’t forget to ask about it! 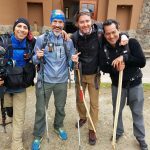 – going into mountain jungle territory in Santa Teresa where a vertigo-inducing suspension bridge is part of the adventure, but there are enough lines to help you gain confidence. A slightly less “scenic” activity but equally adrenaline-inducing, Cusco has a bungee platform near the city centre on the road toward the Sacred Valley. The platform, at just over 120 metres, provides the opportunity to see Cusco and area’s magical landscape, and to metaphorically salute both Inti (the famed Inca Sun God) and Pachamama (Mother Earth) in a matter of seconds. 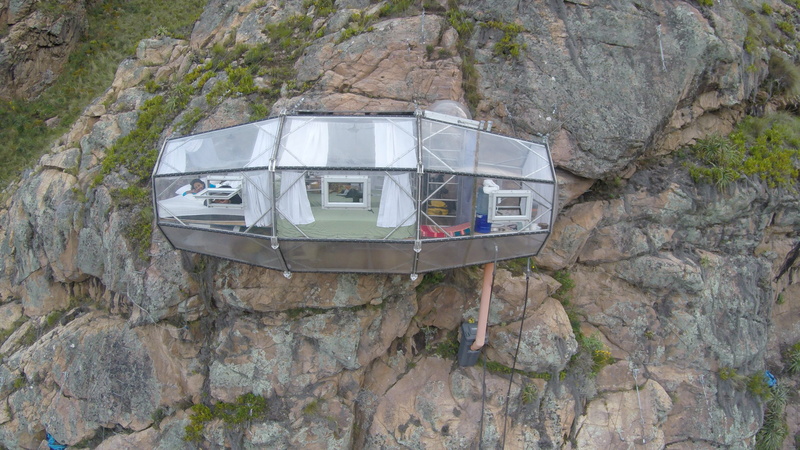 Have you ever wanted to sleep on a rock-face? 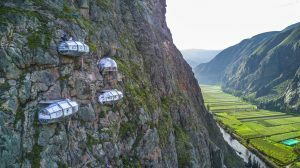 If so, the Skyline Lodge – the see-through sky-high capsules hanging at more than 100 metres off the side of a mountain in the Sacred Valley – is just the ticket. How’s that for a restful night’s sleep? Even if sleeping at such heights gives you night terrors, the starry nights and spectacular daytime views of the valley below are definitely worth the effort. To get to your “hotel,” you can either climb a steel ladder, hike or zipline. You’ll have to earn that beauty sleep! Spending the night in one of the most unique hotels in the world will cost you, but trying to call for room service will be priceless. There are plenty of eco-lodge accommodation options in the Amazon, with many of them functioning in collaboration with indigenous groups, giving priority to sustainability development, self-sufficiency and agriculture of organic crops – the hardest part will be picking one to stay at! As just one of many examples, deep in the Pacaya Samiria Reserve (between Iquitos and Tarapoto), you can spend the night in the treetop canopy, sleeping in one of several treehouses at the Treehouse Lodge. Who needs an alarm clock when you can wake up to the soothing sounds of the rainforest? You won’t exactly be roughing it – each bungalow comes equipped with showers and toilets. You might have to cross a bridge to get to your exotic accommodation. It will be difficult to reach the Refugio Amazonas, also in Tambopata, because its access means an action- and wildlife-packed three-hour paddle journey (plan accordingly to not miss your check in time!). Once at your accommodation, you’ll barely want any downtime. The eco-lodge is home to a large scientific initiative, with scientists working on-site to track and study species in the region. Put your explorer vest on, you’re encouraged to participate! Further upstream, you can reach the Tambopata Research Centre, a lodging for travellers and researchers alike. With absolutely no human settlements nearby, you don’t have to go very far to spot the elusive jaguar, and it holds one of the world’s largest clay clicks for macaw gatherings – just a hop, skip and jump from your comfy bed for the night!